We collect information that you may choose to provide to us when requesting additional information from us or placing an order through our website. This information is collected only for the purpose of completing your request. We do not retain hard copies of your information. All information retained digitally is done through secure servers solely to complete your credit card transaction via shopping cart software and processing credit card information through merchant services. We do not access this information for any purpose other than to complete your order. Your personal information is not shared, sold or rented to any third party. 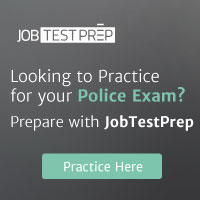 Please note that while PoliceJobsInfo.com will make every reasonable effort to protect your information, no transmission of data over the Internet is 100% secure. In compliance with the Children's Online Privacy Protection Act (COPPA), PoliceJobsInfo.com.com is not structured to attract children. Accordingly, we do not intend to collect personally identifiable information from anyone we know to be under 13 years of age.